To all ya KDE'sters and gearheads and even to those who happen to read my blog and don't give a you-know-what about KDE: Happy new year! At first I decided against blogging about the new year. I could have been writing about the great plans for KDE marketing (including our work on the 4.4 release). After all, there were all these visionary and introspective blogs by Aaron and Richard. But I would have felt kind of forced to mention the new year party I went to - and when sober, i just don't feel like telling anyone. Luckily, I just had a new year 'borrel' from work, including an 'Andre Hazes' tribute singer (most dutch readers now feel a shiver up their spines). And luckily there was beer, so my reservations just dissolved. Here you go: this is how I looked from 31 '09 10:30 to 1 '10 4:00. Other images on my picasa account, yes. Including pretty pirates, pilots and a space princess. I was a light bulb. 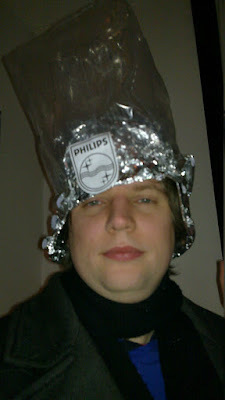 A Philips one, to be exact. The story behind it has to do with me being like 8 or 9. We had to do a 'werkstuk' (like a paper) for primary school. Of course popular subjects were things like "my goldfish" and "Ponies". I was stupid enough to choose the company Philips. No idea why, it's too long ago - but the result was that from then on everyone on school refered to me as "the Philips light bulb". Just don't drink 1-2 bottles of champain each day. They tell me it's unhealthy. google "don't give a you-know-what"